Pam says that the whipped cream traditionally used in mousse dulls the flavor of the chocolate and I have to believe she’s right because this mousse tastes like a truffle. The vanilla ice cream on the side is meant to compensate for the cream not being in the mousse but you won’t miss it, trust me. This was very easy to make and can be done up to a day ahead. She recommends garnishing with a Pepperidge Farm Pirouette which would be adorable. You could also use raspberries, a pizelle, chocolate shavings, heck, you could stick a #2 pencil in here and people would still close their eyes and tilt their heads back when they ate it. I did not have rum so I used brandy and that seemed fine. It gives it pleasant, albeit subtle, boozy flavor. Melt chocolate and 2 tablespoons sugar in a medium bowl over a pan of simmering water. Remove bowl from heat and whisk in yolks, one at a time, until chocolate is stiff but smooth. Whisk in rum and set aside. Meanwhile, beat egg whites and salt in a medium bowl with an electric mixer until foamy. Continue to beat, gradually adding remaining 2 tablespoons sugar until stiff peaks form. Stir 1/2 cup whipped egg whites into chocolate to loosen it. Fold in remaining egg whites until well blended. Cover and refrigerate. 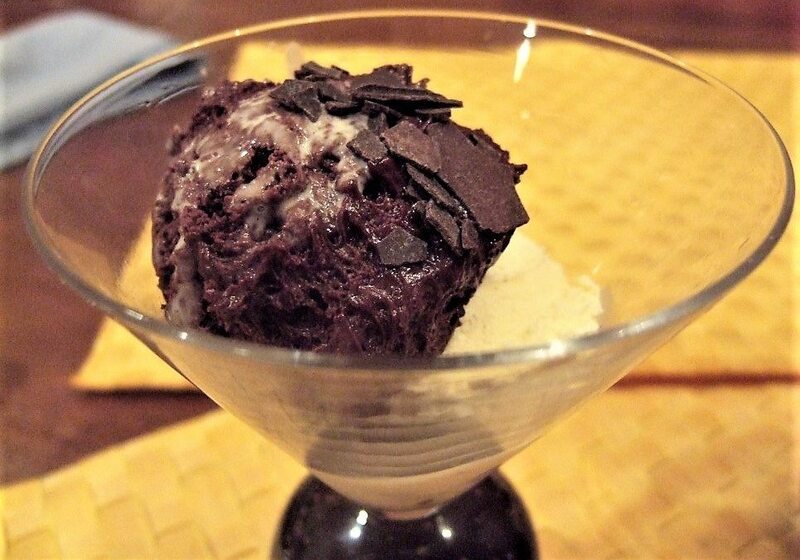 To serve, scoop 1/2 cup mousse and 1/2 cup ice cream into a goblet and garnish. Oh yes!!!!! This is like the version I watched the chefs make in Dijon. No cream. This could be one of the reasons French women don’t get fat.